Below is, as far as I know, the most recent label for Budweiser, updated in 2000. We all know that labels change over time, sometimes dramatically, but usually more subtly with just small tweaks from time to time. But even small changes over a long period of time become dramatic in the long view. So this is a fascinating peak into those changes. Etiquette Systems, a label manufacturer, has an online gallery showing what they call the Evolution of America’s Most Famous Beer Label. 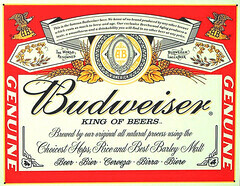 It shows a dozen different versions of the Budweiser label, from the first 1876 version up to the 2000 latest one, with all of the changes in between. Sometimes I think companies pay more attention to logos and labels then they do to the products.